A determined architect continues to pursue her dream of opening a civil war museum in Beirut, where people are still rattled by the bloody events of the Lebanese civil war of 1975-1990. BEIRUT — Mona Hallak, 26, landed on the tarmac of the Beirut International Airport in 1994, four years after the end of Lebanon's 15-year civil war, and headed straight to the center of the capital. Downtown Beirut was once a glitzy hot spot for the city's cosmopolitan elite, but the central area fell victim to the conflict that erupted between Lebanon's Muslim, Christian and Druze communities. And upon returning in the mid-90s, the young Lebanese architect found that the country's national post-war reconstruction process had already begun and was threatening to raze the downtown's history to the ground. Many of the buildings she knew before the war had already been buried beneath rubble or had been flattened by bulldozers. Shocked, Hallak continued to search for something familiar. Nearly three kilometers southeast, along the former front line known as the "green line," she came upon a striking but abandoned Ottoman-era building riddled with war wounds. The project has now become emblematic of the post-war reconciliation process. Several families had lived in the aging, yellow Barakat building before the war. But when fighting began, warring militias occupied the building due to its strategic location and height (it's about 24 meters tall). When the conflict ended in 1990, the building was abandoned. For Hallak, the building was the beginning of an ongoing effort to create the first museum dedicated to commemorating Beirut's history, especially the years it endured a civil war. More than 20 years later, the project has now become emblematic of the post-war reconciliation process in a country that remains divided over how to remember its past. While civil society groups and NGOs are working to confront the issues of memory and forgiveness, most Lebanese political parties, many of whom were active in the war, are not. Lebanon, according to the International Centre for Transitional Justice (ICTJ), has "state-sponsored amnesia." History textbooks do not teach the war. There has yet to be a truth commission established to settle the cases of the thousands who disappeared during the fighting. And there have been no serious attempts to hold perpetrators of war crimes accountable. "Here, history is a political issue because it cannot be agreed upon by those in power, and across the country," says Maha Shuayb, president of the Lebanese Association for History, a collective of history educators and activists who advocate for the development of Lebanon's history curriculum. Shuayb, who also directs the Center for Lebanese Studies, has long worked with educators and the government to update Lebanon's curriculum, which is unchanged since the 60s, and fails to include the war. She says her attempts have been fruitless because the Lebanese government has not been able to agree on how to teach or remember the bloody conflict. Rather than addressing the sectarian divisions that sparked the war, the Lebanese state perpetuates the same divisions in society, she added. Consequently, the burden of steering the country's truth and reconciliation process falls to civil society. But this endeavor cannot hope to succeed without the input of public stakeholders, most notably the Lebanese state itself, says Ziad Saab, a former civil war militant who now runs the only organization in Lebanon uniting former combatants from different political, religious and social backgrounds. "Most people would rather just protect themselves and their families by not talking about the past," Saab says. "Since no one is willing to talk about the issues of the past, we believe that it's our responsibility to put it all on the table," he adds, referring to civil society groups. Saab, the founder of local NGO Fighters for Peace, has also taken on the burden of encouraging Lebanon to reconcile with the past. Through the organization, Saab and other combatants recount their experiences to the country's younger generation through workshops and dialogue sessions. Between 2014 and 2017, FFP held 280 sessions and workshops in schools, universities, clubs, women's groups and municipalities. But he says the organization has received little support from the state. "They never encourage up," Saab explains. "We try our best and we have not lost hope, but our efforts are never helped by the state." Like Shuayb and Saab, Hallak's efforts toward collective remembrance of the war have also been fraught with challenges. After that first time, Hallak continued to visit the Barakat building, piecing together the history of the deserted structure. From the love letters of a dentist who once lived in the first floor's eastern apartment, to trinkets left behind by various militia groups, she began to accumulate her own archive. The organization has received little support from the state. 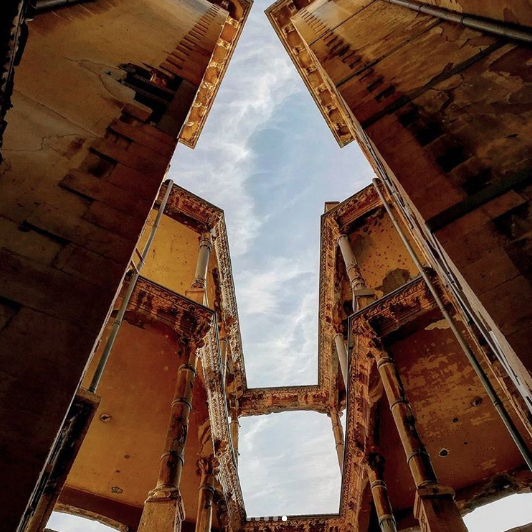 In September 1997, when the owners of the Barakat building were requesting its demolition, Hallak spearheaded a campaign for its preservation, arguing that it held intangible value to the city and country's history. Between 1997 and 2002, Hallak worked on publicizing the building's importance, through interviews, public walking tours and other events. 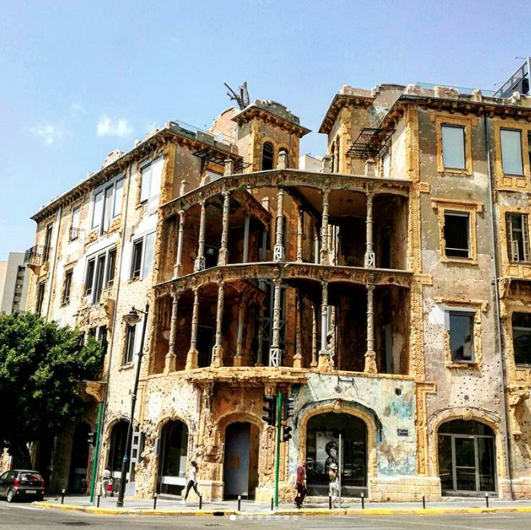 She eventually succeeded in saving the structure when Beirut's municipality announced in 2003 that it would allow for the preservation of the building with the aim of turning it into a civil-war museum. The municipality would pay $3 million to the owners of the building in 2006, only days before the outbreak of Lebanon's 30-day war with Israel. Following years of slow planning, the Barakat building eventually underwent an $18 million restoration with support from France in 2012. Hallak's intention seemed to be recognized by the municipality at the onset of the restoration, when Bilal Hamad, then mayor of Beirut, promised that Beit Beirut, as the new space was called, "will turn into a national museum and a cultural center in memory of [the city]." But more than one year later, the Barakat building remains a nebulous space. With no museum staff, no official hours or permanent exhibitions, it is stuck in limbo, hosting events, performances and temporary exhibitions every so often. Some have been wholly connected to collective memory and the civil war, while others have not. "This museum has become my child. I have loved and protected it for 23 years because of its importance to the Lebanese people, and [to] me as someone who grew up during the war," says Hallak. "To see what it has become — a venue for glitzy events unrelated to civil war remembrance — is never how I ever envisioned it to become." While the Beirut municipality has repeatedly assured Hallak that Beit Beirut will soon be opened as the civil war museum it was always intended to be, the delay in realizing the project has cast doubts over whether the space will ever fulfill this purpose. "The idea of Beit Beirut is amazing, but unfortunately the spell of the public sector is obviously infecting it," says Shuayb. "When it was bought by the municipality, I had very little hope it would become the museum we hoped to see." This museum has become my child. Ziad Chebib, governor of Beirut, assures Peacebuilding Deeply that the building will soon be transformed into an official museum of memory. He acknowledges the building's historical importance, calling it a physical "engravement" of the city and country's modern history. Echoing Hallak's sentiments, Chebib describes it as a "site for dialogue" and a "lesson for upcoming generations." He adds, nevertheless, that the municipality is still finalizing internal rules and policies needed to run an "official museum of memory." And he can't say exactly when the museum will open. Despite assurances of an opening, the museum's voluntary scientific committee — a group of local experts committed to advising the municipality — no longer convenes on a regular basis. Several of its members declined to respond when contacted about Beit Beirut's current status. One member, however, who asked not to be named, said via email: "Believe me, it would be more useful to get in touch with the governor of Beirut and ask him why till now, Beit Beirut does not have a legal structure. He promised the mayor of Paris during his speech on Sept. 29, 2016, that it would be ready in two weeks!" Acknowledging their lack of enthusiasm, Hallak says that years of working with the municipality without seeing any development undeniably put a damper on the committee's efforts. "The building itself is a museum with all it encapsulates," Hallak says, weary but still committed. "Regardless, to be a real museum, it needs a director, it needs a vision, it needs a curatorial policy, it needs staff," she adds. Today, Beit Beirut is not open as a museum of remembrance, but I will keep working until it is."